Have you been diagnosed with osteoarthritis and given limited options? The traditional recommendations often include pain medications, weight loss, cortisone injections, and stopping athletics, while waiting for the joint to degenerate enough to warrant undergoing a joint replacement or fusion surgery. Who really wants to pop pain pills, stop sports, and wait for the joint to degenerate so badly that surgery is the next step? Isn’t there a better way? The frustrations with these limited insurance network pain treatments have made Regenerative treatment options like Prolotherapy, including Platelet Rich Plasma, and Stem Cell Prolotherapy, increasingly popular. Did you know that nonsteroidal anti-inflammatory drugs (NSAIDs) and corticosteroid injections are among the most commonly used “treatments” for arthritis? Yet, one of the well-documented long-term side effects is the negative impact on articular cartilage. (See Figure 1.) These treatments actually accelerate the very disease for which they are most often used and prescribed. Other common arthritis treatments, such as hyaluronic acid (viscosupplementation), exercise, physical therapy, weight loss, and lifestyle modifications are helpful at decreasing symptoms and improving mobility, but they do not repair the source of the problem or reverse the disease. Since soft tissue is mainly responsible for the smooth movement necessary in the motion of the joint, injuries disrupt the balance between normal motion and instability. 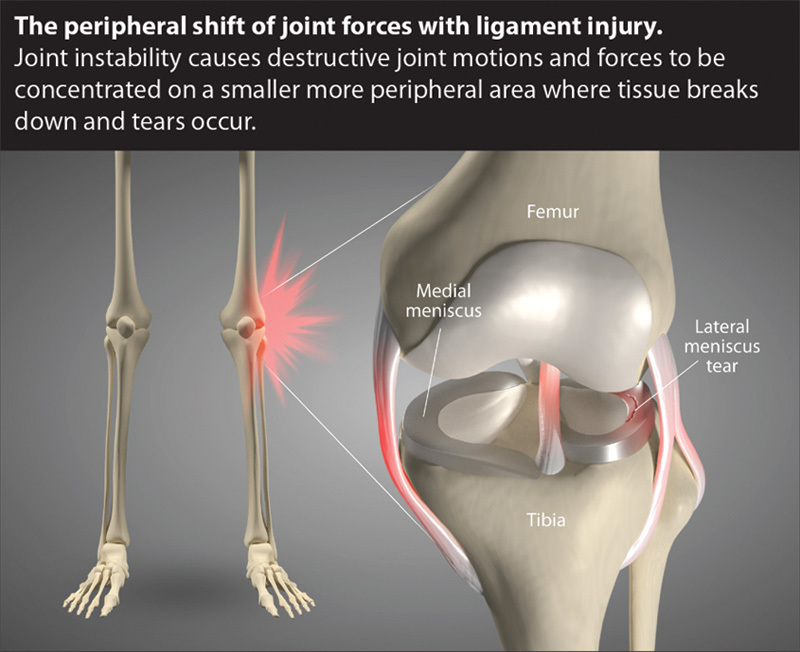 The disrupted balance causes an uneven weight distribution inside the joint, with joint surfaces rubbing roughly and breaking down articular cartilage, limiting joint function, causing bone loss and eventually leading to the bony overgrowth of osteoarthritis. Ligaments connect bone to bone and allow for smooth joint movement. 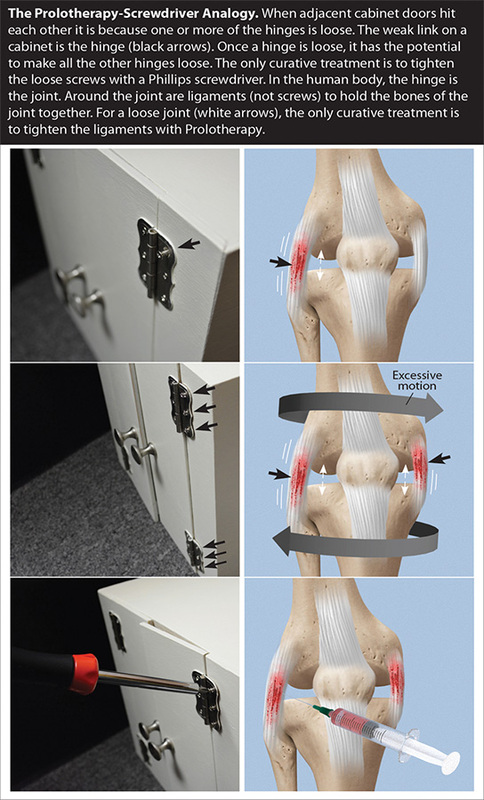 Just as a screw stabilizes a hinge, the ligaments stabilize our joints. Consider a pair of cabinet doors. If the doors are hitting, they do so because a hinge is loose. Any loose hinge starts with one loosened screw putting added pressure on the other screws in the hinge until the entire hinge is loose. This analogy can be applied to the entire joint degeneration process. Abnormal wear and tear from joint instability causes cartilage breakdown, eventually resulting in degenerative osteoarthritis. By comparison, continued use of a door on a loose hinge leads to added pressure and loosening of other screws, causing the door to wobble further and eventually hit the adjacent door. To quickly remedy this, a screwdriver can be used to tighten the screws and stabilize the door. In the human body, the treatment to stabilize joints is known as Prolotherapy (Regenerative Injection Therapy). It stimulates repair/regeneration of the ligaments so the bones glide properly, without hitting one another and wearing down the joint. (See Figure 4.) In summary, joint looseness causes osteoarthritis. Prolotherapy tightens loose joints and eliminates arthritis pain. network, the treatment series is an affordable option, considering it is an alternative to surgery that allows patients to work and exercise while the tissue repairs. Patients feel it is worth going out-of-network for better long-term results that focus on maintaining an active lifestyle. Prolotherapy, with or without the use of a person’s own blood or stem cells, can be utilized to treat and restore most of the degenerated structures as well as the functioning of the joint. Even most bone-on-bone osteoarthritis cases can be helped without the need for surgery. 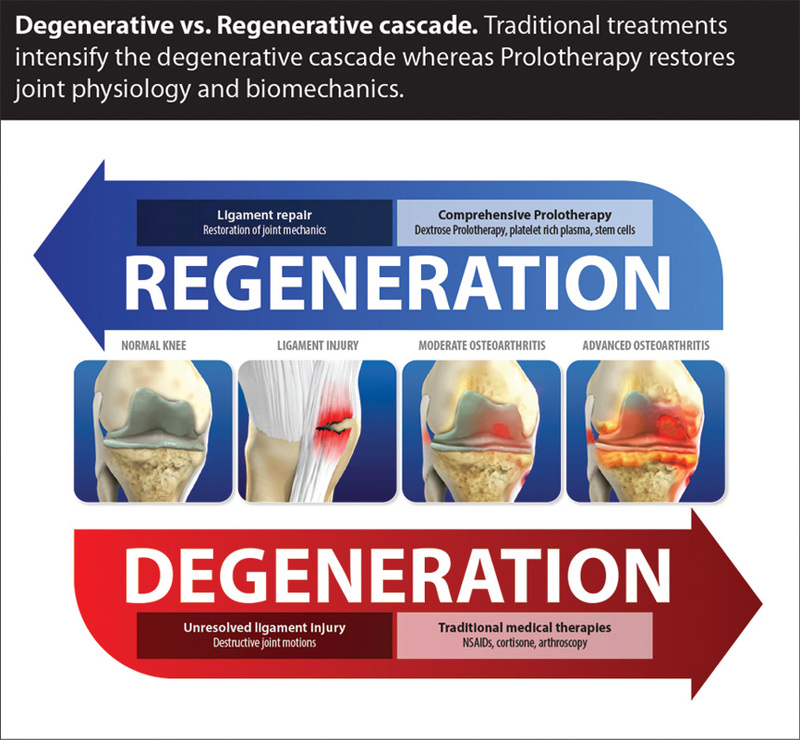 Post-surgical pain cases are also typically still candidates for regenerative options like Prolotherapy or Stem Cell Therapy. For instance, patients who have already undergone replacement surgery or fusion but still have chronic pain, often have undiagnosed joint instability/looseness that Prolotherapy can fix. However, its primary use is keeping patients from needing a joint replacement, fusion, or other joint surgery in the first place. Whether in the early or later stages, the regenerative options for arthritis pain are better than ever, making decreased mobility and chronic joint pain from arthritis become a thing of the past, along with the traditional, outdated treatment options that only mask the pain source. Previous Q&A: How common are kidney stones?